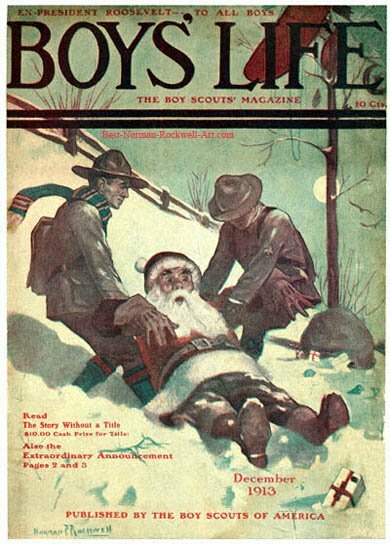 Santa and Scouts in Snow, this Norman Rockwell painting, appeared on the cover of Boys' Life published December 1913. This marked Rockwell's fourth cover publication. His fourth month in a row! This was also his first Santa Claus cover. Another milestone for Rockwell. The first of many. By now, Boy Scout readers had already become familiar with Rockwell's work through his article and story illustrations in previous editions of the magazine. Rockwell had been serving as the art director of Boys' Life since 1913. Boy's Life was the 18 year old's first job with any magazine. Before being hired by Boys' Life, he had been painting commission work. This included Christmas cards and portraits. The first issue of Boys' Life was published in March of 1911. The magazine was still a fairly new publication in 1913. Certainly, a large part of its earliest success was due to its fine young art director, Norman Rockwell. Compare this painting to Norman Rockwell's first cover for Boy's Life and note his continued growth as an artist. More effective use of light and action is evident. A defined feeling of depth is evident in this work. Santa Claus has had an accident. He is lying in the snow, just as surprised about his predicament as anyone else. Luckily for Santa (and all the little boys and girls) two Boy Scouts happen by the scene. They help him out of the snowdrift, which was no mean feat by itself. Santa doesn't appear to be injured. If he were, though, he would be in the right hands. Boy Scouts are trained in First Aid and always prepared. It looks like the Boy Scouts will help Santa pick up his wrapped presents out of the snow and stuff them back in his magic bag. Thanks to the Boy Scouts, Christmas will be wonderful for all the good little boys and girls.